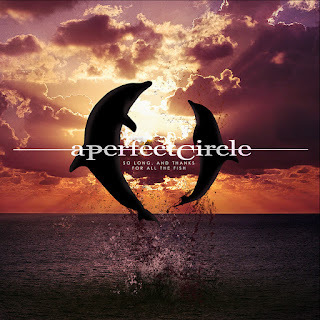 A Perfect Circle have shared their new song "So Long, And Thanks For All The Fish" as the release date for their upcoming album "Eat The Elephant" out April 20, BMG nears. The song premiered on BBC Radio 1’s Rock Show as Daniel P. Carter’s Rockest Record and is available now to stream or download. "We all cope with the absurd in our own manner," said Maynard James Keenan in reference to the new track. "The Italian side of me produces and shares wine with friends in order to feel grounded and connected in the midst of all the madness. But once the wine is gone, the drunk and sarcastic Irish side of me goes straight for the unreasonable jugular. #comedyfirstandalways". Check it out here: https://aperfectcircle.lnk.to/FishAudioPR.